Served warm or cold these are sure to please, replace the asparagus with some red onion marmalade for another flavoursome variation. Roll the puff pastry and brush with egg wash. Season with salt, pepper and lemon zest then blind bake in the oven for 12 minutes. In a medium sized pan, add butter, shallots and thyme. Sauté for 3-5 minutes on a medium/low heat. Add wine and seasoning and cook for a further 2-3 minutes. In the meantime, boil a large pot of salted water and prepare a bowl of ice-cold water. Tip the asparagus into the boiling water and simmer for 2-4 minutes depending on the size of the asparagus. Transfer the asparagus to the ice cold water to stop the cooking process. 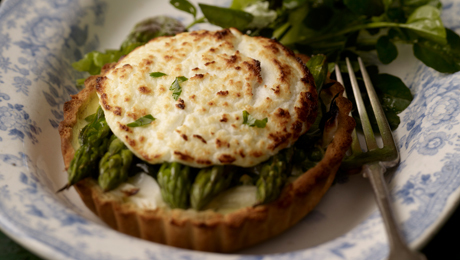 Fill blind tart with sautéed shallots then goats cheese and top with asparagus. Season with extra salt, pepper and lemon zest. Bake for 5-10 minutes to allow the cheese to melt and caramelise.